In a corner of Pueblo Libre, Lima . . . one of the most important buildings in Peru | A balanced diet . . . In a corner of the Lima suburb of Pueblo Libre, on one side of Plaza Bolivar, the Museo Nacional de Arqueología, Antropología e Historia del Perú (the National Archeological, Anthropological and History of Peru Museum) is arguably one of the most important buildings in Lima. Peru, even. When Steph and I lived in Lima, we visited the museum on several occasions. It looks as though it has had a major face-lift since the 1970s. 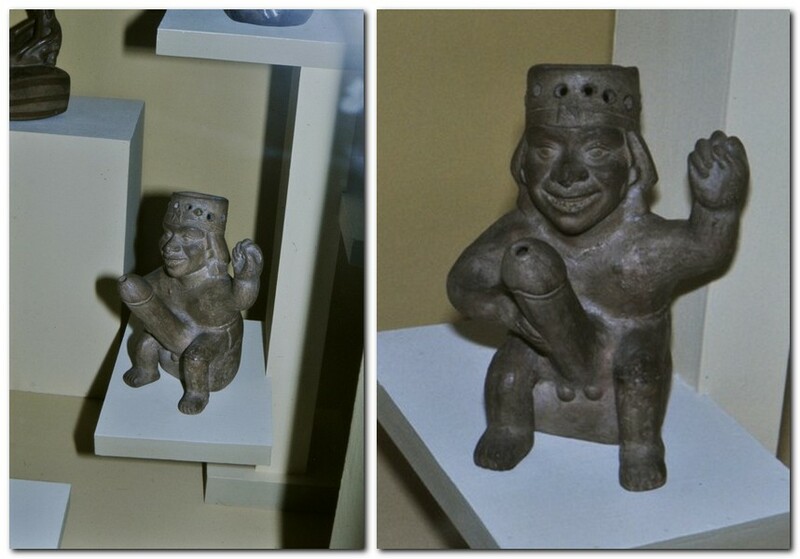 It houses one of the finest collections of pre-Columbian artefacts. Anywhere. There are more than 70,000 pieces of ceramic alone. Many must be priceless. These reflect the various indigenous cultures that grew up in Peru (over hundreds and thousands of years) along the coast and in the mountains, before the Spanish arrived in the early 16th century and destroyed them. 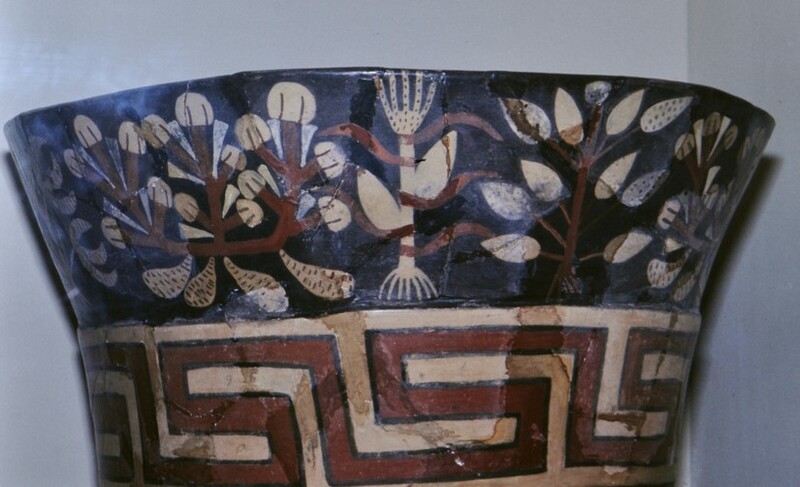 As a student of the origins and evolution of crop plants I’m particularly interested in what these fine ceramics can tell us about the crops that dominated ancient cultures. I would relish the opportunity to return and, on this occasion, more carefully document what I saw. Most of the plants we eat were domesticated from wild plants by farmers thousands of years ago, who developed agricultural systems to grow them and provide food for their families and communities. Peru is the home of many crops important in world agriculture, not least, of course, being the potato. When we begin to look at the origins and evolution of crop plants, we examine the distribution of indigenous crop varieties and where these overlap with the wild species from which they were originally derived. We study their genetic variation patterns, make experimental crosses (pollinations) between crops and wild species to see how inter-related they might be, and compare the offspring with existing varieties. My own research on potatoes, grain legumes, and rice has followed this pattern. But we also want to be able to track when things happened. And that’s where archaeology and anthropology come into play. In many famous archaeological sites in the so-called Fertile Crescent of the Middle East (one of the earliest cradles of agriculture), carbon-dated remains of cereals are associated with the earliest stages of agriculture, some 10,000 years ago, at a time that is often referred to as the Neolithic Revolution. Archaeologists can tell from these plant remains whether human communities were collecting grains from wild plants or whether they were growing a crop (domesticated cereals, for example, have lost the ability to disperse their seeds, and there are clear anatomical and morphological characteristics that differentiate these from wild plants). 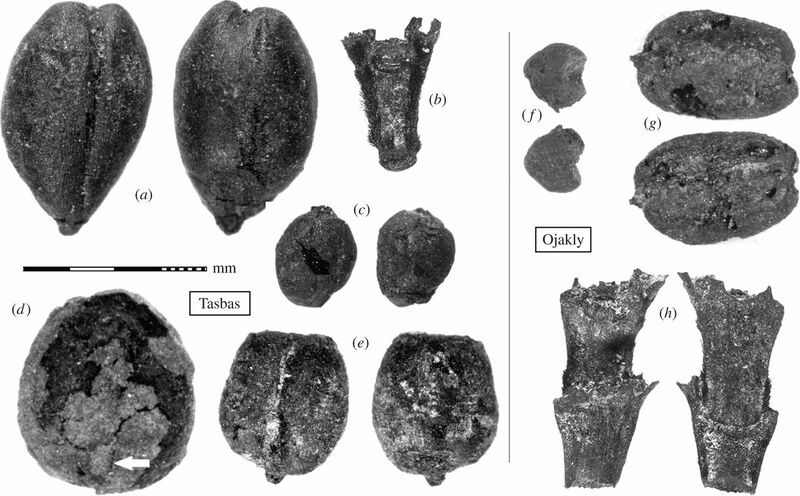 Here is an example of such remains (of several crops) from a Central Eurasian site. 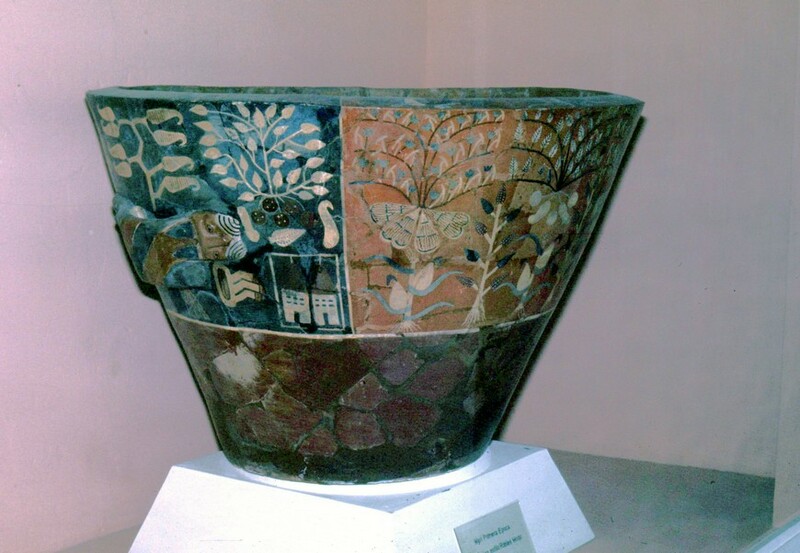 But an additional source of information about pre-Columbian cultures and their agriculture in Peru for example can be found in the exquisite ceramics (or huacos) that so many coastal cultures—Chavín, Nazca, Moche, Chimu, among many—left behind, and which have been recovered from graves in the vast cemeteries along the coast. Many pots have the form of crops grown at that time, 1000 years ago or more, such as potatoes, cassava, lima bean, and many more. There are also representations of animals such as llamas and monkeys. Some ceramics of fruits and vegetables have even taken on human form! My inspiration was Professor Jack Hawkes, my mentor and PhD supervisor, potato taxonomist extraordinaire! He was fascinated by archaeology, and pre-Columbian archaeology in particular, an interest that he had developed following his first visit to Peru in 1938-39. 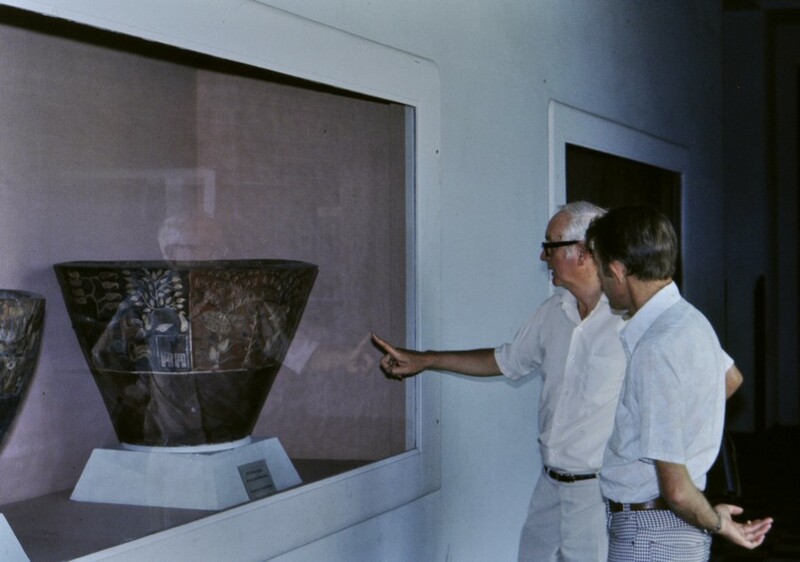 In this photo, Jack is describing to CIP colleague Jim Bryan, a particularly fine Hauri (Wari)ceremonial urn – just look at the size – decorated around the rim with portrayals of different crops. Can you recognise any? There’s certainly potatoes (Solanum tuberosum) and chili peppers (Capsicum spp.). Maybe even peanuts (Arachis hypogaea). On a second pot, there’s oca (Oxalis tuberosa) and maize (Zea mays). If I had been more assiduous 40 years ago I would have carefully noted the details of each pot. But I didn’t. In the gallery below, the brightly painted pots are from the Nazca culture I believe, and the others from the Moche/Huari cultures. 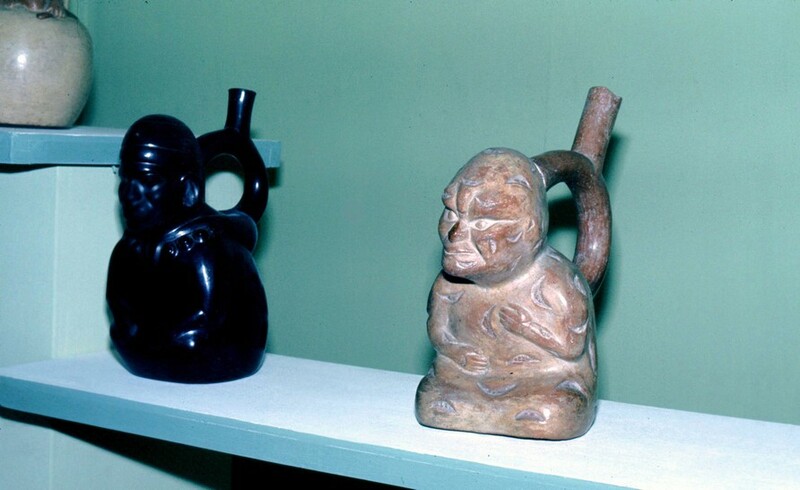 Then there are the ‘other’ ceramics, in a discreet section of the museum (or at least that was the case in the 1970s) of the rather explicit ceramics related to fertility rituals presumably. My, he’s a big boy! Many of the ceramics were found wrapped inside so-called mummy bundles, buried in the sand of the coastal desert. 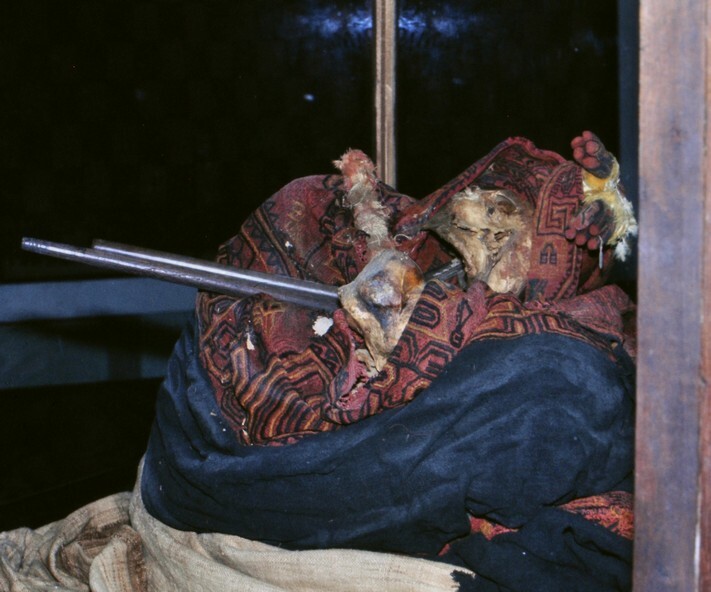 Bodies were quite well-preserved because of the very dry conditions, and wrapped in beautiful textiles. On display in the museum there are examples of skull distortion practised by some of these ancient cultures, as well as head surgery or trepanning. There are also examples of the famous Incan counting string or quipu, and some gold artefacts that I remember, like this solid gold tumi, a ceremonial axe or knife. 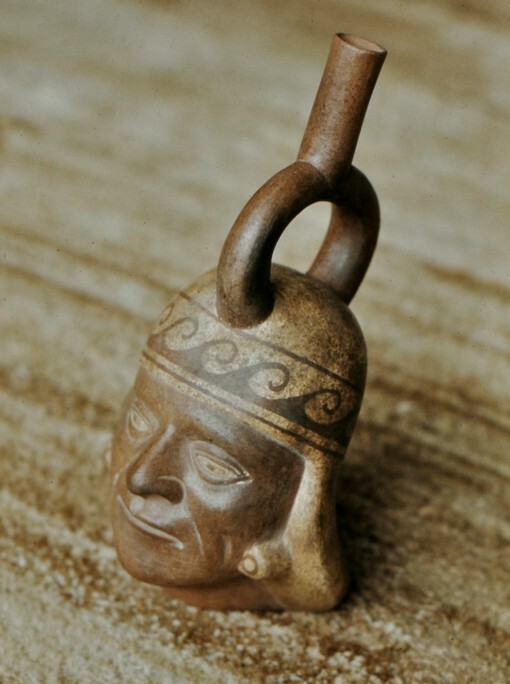 In this post I have just lightly touched on the splendour and interest of pre-Columbian Peru. Peru justly has a proud heritage, both human and crop, that must be cherished. In a small way, and over the decades I have been able to experience these at first hand. No visit to Lima should miss a visit to this national museum. There are many fake ceramics around for tourists to buy. This is a ‘Mochica’ one that Steph and I purchased while in Lima. Yes, we knew it was a fake, and paid a token amount. But we liked it, and it has graced a shelf in our homes in Peru, Costa Rica, and the UK ever since. What if it were genuine? It would be worth a pretty penny. This entry was posted in CIP, Musings from the past, Travel and tagged agrculture, Chavin, Huari, Moche, Nazca, Peru, pre-Columbian cultures, Wari.